​As exterior painters in Jacksonville, we always strive to exceed the expectations of our customers. We are a the leading exterior painting contractor in Jacksonville. With over 28 yrs in the painting industry, we specialize in all phases of commercial & residential exterior painting. ​When painting the exterior of your Jacksonville home or business, consider several aspects. Many exterior painters in Jacksonville have no clue how to provide a waterproofing effect when painting in Florida. They just were never taught! Choose the right exterior painters in Jacksonville for your exterior painting needs. Exterior painting value! Know the correct exterior painting process; before choosing an exterior painting contractor. Exterior painting in Jacksonville should have focused planning. Many variables come about and planning a method of attack is paramount. A scope of work will be established for your exterior; before the project begins, and we stay adaptable to changes. Pro Color has painted and waterproofed 1000s of Florida structures; and still evaluates and plans each exterior project. Pressure cleaning with high power or a "soft clean", your exterior surfaces must be clean and ready to accept caulk, primer and paint products. Surfaces that are not prepared will fail; causing headaches and costly expenses. Make sure the exterior surfaces are cleaned prior to exterior painting. This is especially important when exterior painting in Jacksonville, Florida. Preparation may be the most important aspect of exterior painting. Proper caulking, patching & primer can mean the difference in getting a beautiful, long-lasting exterior paint job that holds up to the elements; or just coloring the exterior for a quick fix. Remember, extensive and proper prep brings value and protection. Raw or troubled surfaces must be primed with the right primer/sealer. This will ensure the finish coat leveling, improve aesthetically and promote adhesion. Many overlook this important process as to speed things along and you pay for it later. Primer can make all the difference and reduce costs in the long run. You don't want to skimp on exterior paint products! You get what you pay for with exterior paint; and using lower grade exterior paint can invite a wide variety of problems. Using upper grade products can save expenses later. We recommend using the best exterior paint within your budget for your Jacksonville home or business. It’s much more efficient in every aspect than using lesser brands. The labor involved for exterior painting overrides any "savings" buying lesser grades. UV protection to keep your exterior paint finishes from fading in Florida’s extreme sun. Moisture protection solids keep water from intruding and ruining your home’s exterior surfaces. Mold inhibitors prevent mold or mildew from developing. High solids & resins to promote adhesion; producing longstanding durability. Elasticity: All the high grade Acrylic Latex paint has a flexibility that works well in the Jacksonville climate. Expansion and contraction happen when temperature changes and by getting wet and dry over and over. The methods and tools required to apply the exterior paint can make or break your entire project. Applying the proper wet mils and D.F.T. is what separates professional exterior painters and those that would just color your Jacksonville exterior. Some exterior painting contractors don't even know what a mil gauge is; much less use them. The amount and consistency of your finish coating is very important. Make sure your exterior painting contractor has a concept of this. ​Once your exterior painting contractor has finished; you'll want to power wash or clean the exterior every 12-18 months depending on each specific situation. This will keep your exterior surfaces healthy and add longevity to your exterior paint job. Painting the exterior of your home or exterior painting of any structures; will protect the surfaces, enhance curb appeal, add value and beautify outdoor spaces. Painting the exterior of your Jacksonville home is the most efficient make over overall as to achieve prestigious results. If you have ever attempted your own exterior painting; then you know what a daunting task it may be. Be sure to hire the right Jacksonville painters! Of all the factors to consider with exterior painting; costs seem to lead the pack. Remember, "costs" are all totaled expenses out of pocket. Below, we will look at a general view of several factors concerning exterior painting costs in Jacksonville, FL. 1. Current surface condition: This can play a major role with the amount of time involved in painting the exterior of your home or business. Peeling, blistering or failing finishes need to be removed prior to new exterior paint or water-proofer. This may add extra labor & expenses outside the realm of a “standard” exterior paint job. 2. Texture: Exterior stucco surfaces can be a "smooth", flat finish, or the common “Rough” texture, or even Drivit; a Synthetic Stucco. Brick, wood, composite, Coquina, vinyl or even metal are used as well. 3. Height: Many height levels exist here in Jacksonville; single one story homes can range from 8, 10, 14 ft. and then 2nd, 3rd or 4th story homes in North east Florida do exist as well and vary in difficultly. Height is an important factor when considering exterior painting costs. 4. Accessibility: The question here is; what degree of difficulty will exterior painters have accessing the surfaces of the home for power washing, prep and applying exterior paint? A few examples or obstacles would be; needing ladder or lifts, foliage, fences, power lines, unusual slopes, etc. Really, any obstacle can hinder your house painters from applying exterior paint to your home. A lot of homeowners ask, "what grade of paint should we use". Exterior paint normally runs around $25-60 per gallon and you'll want to use the highest quality your budget allows. This includes sealers and primers as well. Using quality paint and primers for exterior painting ensures longevity and saves on future labor cost. It’s never smart to skimp on paint. You get what you pay for concerning exterior paint. 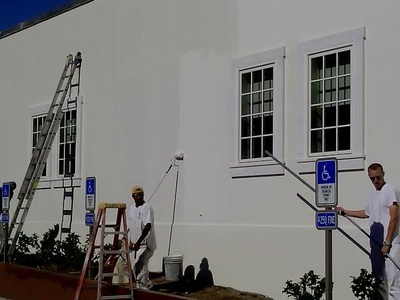 Most Jacksonville exterior painters do not "mark up" the paint purchased and will have the necessary tools, brushes, rollers, sprayers and caulk to paint your Jacksonville home; of course you pay for the labor. In most cases, exterior paint and supplies will be approximately 20% of the total expenses and labor the remaining 80%. So it's easy to see; by using a high grade paint that lasts longer; there will be less labor in the long run! Labor is your major cost with exterior painting. Be sure that your exterior painting contractor replaces rotted wood or siding. Indeed, these wood rot repairs will add to the expense of the exterior painting project. Not all exterior painters can do wood repairs (we do); they need to call in another contractor and this can slow progress and add unnecessary expense. If your Jacksonville home or business is brick, stucco or any cementitious surface; a consideration to look for is efflorescence. It’s when water being driven out as a result of the heat of hydration as the cement stone is being formed, this brings salts to the surface. As the water evaporates, it leaves the salt behind, which forms a white, powdery residue sometimes even fluffy or crystallized deposits. This must be removed and a masonry sealer applied before exterior painting can occur. A thorough power washing and an extensive rinsing is effective; followed by the masonry sealer application. Power washing the exterior is usually mandatory to achieve proper exterior adhesion for your exterior coatings. It removes pollen, mold, mildew, pollution and that chalky white residue called efflorescence. Always make sure your exterior is pressure cleaned AND rinsed prior to prepping, priming or painting. Exterior painters' quotes can be lower in the off-season rather than in peak summer months. 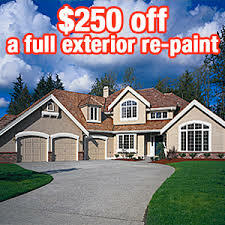 Ask about a exterior painting discount if the project is done on a fill-in basis, in between other projects. In addition, consider other areas of your home's exterior that need painting; such as fences and driveways. If an exterior painting contractor is setting up to do the exterior of the home, additional exterior painting or staining may cost a lot less if the exterior painter is already on site and is able to paint these additional items. Here at Pro Color we do much more than just exterior painting. 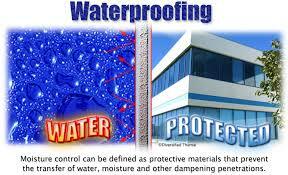 We are well versed in the water-proofing aspects needed here in Jacksonville, Florida. In addition, we provide wood repair, drywall repairs, power washing, commercial painting and epoxy floor coatings. Hire the best exterior painters in Jacksonville, FL. 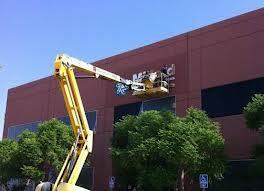 Contact exterior painters who will make the exterior painting process smooth and hassle free!